Revenue in the Digital Media market amounts to US$41m in 2019. The market's largest segment is Video-on-Demand with a market volume of US$19m in 2019. In global comparison, most revenue is generated in United States (US$46,167m in 2019). Digital Media is defined as audiovisual media contents and applications that are distributed directly over the internet. This includes digital video contents (e.g. movies, series and TV shows), digital music provided as download or internet-stream as well as digital games for different devices and electronically published content such as eBooks, eMagazines or ePapers. Reading Support Revenue in the Digital Media market amounts to US$41m in 2019. Reading Support The Digital Media market is expected to show a revenue growth of 7.9% in 2020. Reading Support In the Video Games segment, the number of users is expected to amount to 0.8m by 2023. 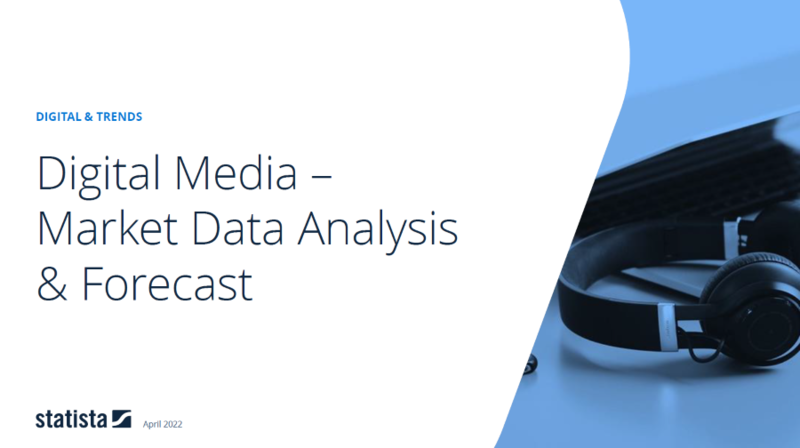 Reading Support User penetration in the Digital Media market is at 26.3% in 2019. Reading Support The average revenue per user (ARPU) in the Video Games segment amounts to US$26.19 in 2019. Reading Support With a market volume of US$46,167m in 2019, most revenue is generated in United States. Here you can find more studies and statistics about "Digital Media".